Are you starting to sweat? Is that summer heat sneaking its way into your life, making your body uncomfortably warm? That can only mean one thing...flea market season is upon us! It's that joyous time of year where we comb endless aisles of junk in the blistering heat. It's a sad, yet glorious, search for something "special." 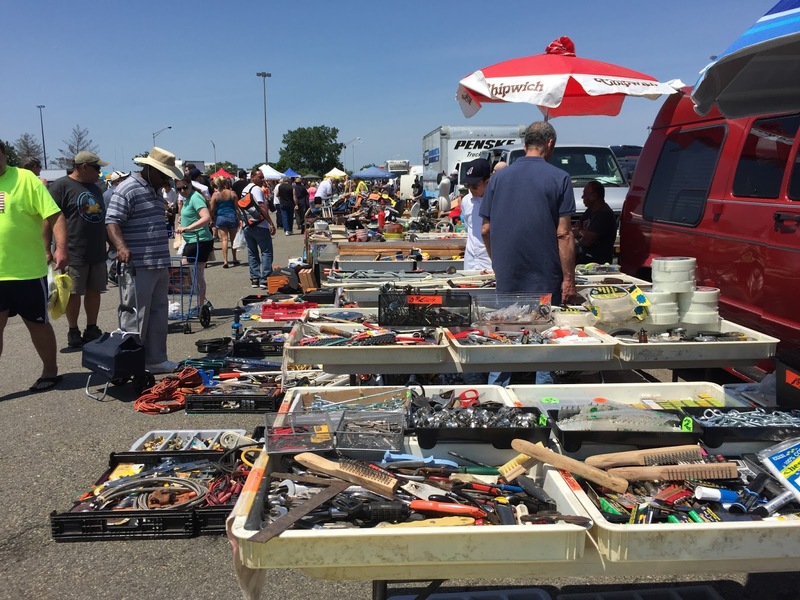 Your quest might be specific, but with a flea market, you never know what you'll walk away with. Each visit is a trip into the unknown, a trip into a Twilight Zone of secondhand goods. My 2017 flea market season kicked off like no other. Since moving out of NYC, I found myself in uncharted flea market waters. My new home in Kinnelon, NJ presented a promising batch of new places to explore. NYC was a flea market wasteland with high-end, hipster-fueled markets making up the majority of the scene. Don't get me wrong, I love a good artisanal donut, but I love dirty junk for cheap prices much more. It's safe to say my new NJ home has opportunity everywhere for junk exploration. But an experienced explorer knows better than to make his maiden voyage alone. Luckily, my fiancé (Jess) and my buddy Simon (aka @NecroticDoctor) were willing to navigate the new flea market scene with me. I'm not the biggest football fan. I enjoy a game here and there, but if you really want to lure me to the stadium it's best to have a flea market there. 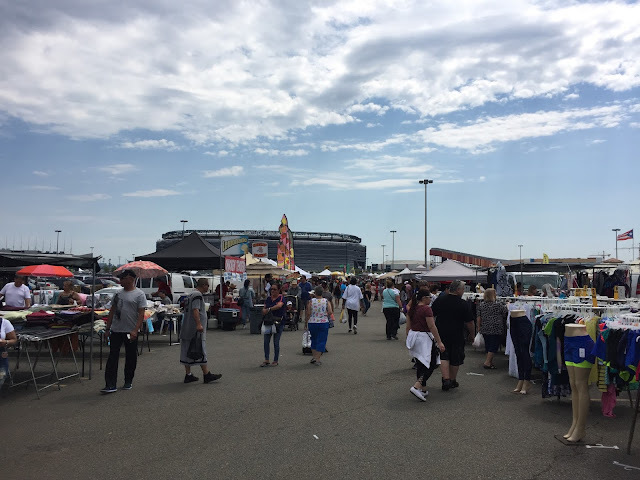 And that's just what MetLife Stadium has done with the New Meadowlands Flea Market. Every Saturday in the summer, the parking lot of the Giants & Jets' home becomes alive with bustling vendors. The gigantic stadium idly watches over the action as the aroma of savory street foods pull you through the maze of concrete paths. Before diving into my exploration of junk, the food options at the New Meadowland Flea Market earned themselves a mention. Brooklyn-style gourmet hipster snacks are nowhere to be found here. I've been to flea markets in New Jersey before, but never have I seen such a carnival-like menu that seems masterminded by a 7-year old with a sweet tooth. 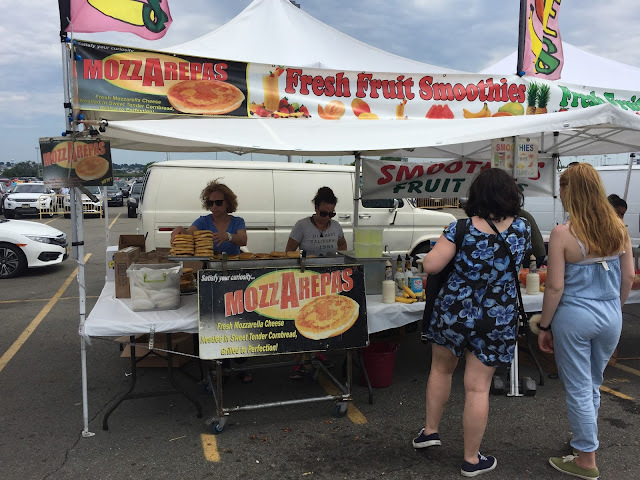 Within minutes, we marched passed a fried Oreos stand, a funnel cake truck, and table that sold something called a "mozzarepa" (my stomach quivered just looking at it). A combination of iron will and fear kept me from dropping cash on a morning snack. The New York Pickle Man was there too! 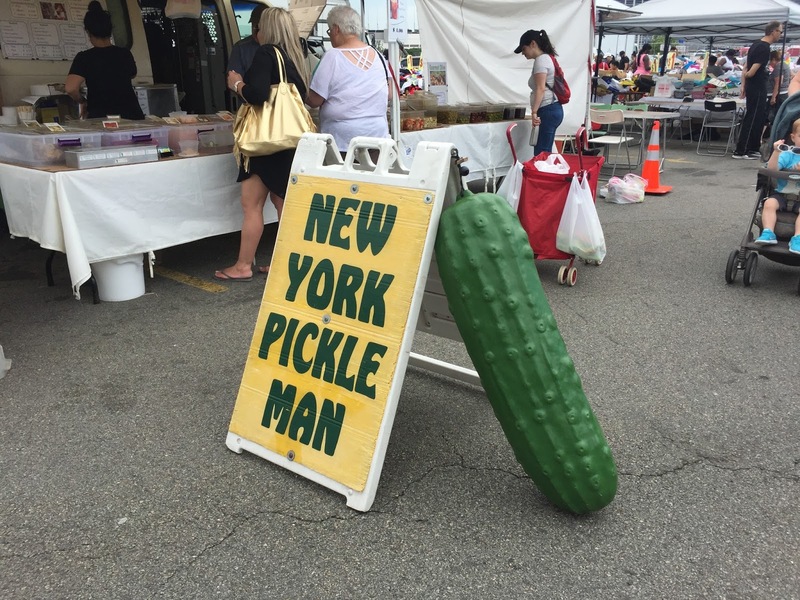 You don't know the New York Pickle Man? Me neither. But, any sign accompanied by a 3-foot Pickle deserves praise. I could've turned around, went home, and consider the day a success after seeing a sign as goofy as this one. Leaving the food area was like escaping from prison. Every time we shifted our direction, we were greeted by another food vendor seemingly guarding the exits. After succumbing to a lemonade purchase, that acted as our ticket to freedom. We finally were able to slip away into the aisles of secondhand goods. And it was beautiful! There was junk as far as the eye could see. From decent quality to dirt-encrusted, the items on display were just as diverse as the market's food choices. We slowly roamed like zombies through the aisles, the heat forcing us to drag our feet like the undead. 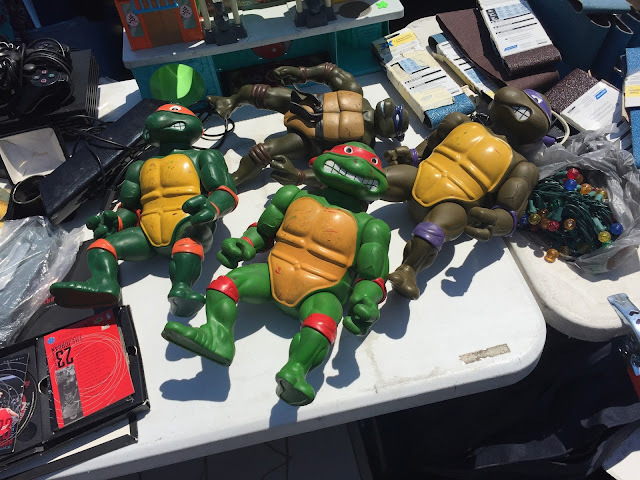 There was a handful of TMNT toys throughout market. Nothing worth purchasing, but one table presented an image that really resonated with me. Forget beaches, watermelons, and backyard barbecues, the visual of dirty Turtles toys baking in the sweltering sun is my quintessential summer symbol. 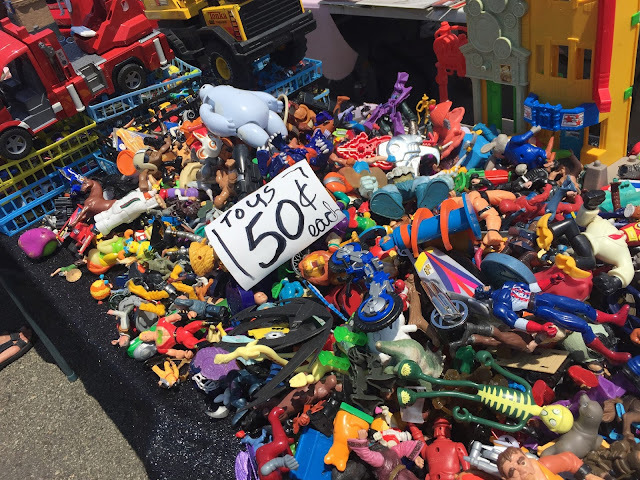 Hot dogs on the grill might work for the rest of America, but for me, it's old plastic toys cooking on a flea market table that tells me the season is here. Through the heat we stumbled upon plenty of oddities. Finding a rare TMNT toy in the wild is fun, but nothing compares to the weird items people proudly put on display. At one table, we spotted a few adult films on VHS next to a blender and a flower pot. Another vendor had adult toys strategically placed by a collection of exercise gear. We even heard someone not whisper, but shout, that adult diapers were only one dollar. Welcome to North Jersey, friends! If people ever think I'm a weirdo for housing a room filled with TMNT gear, let it be known, I'm just a drop in the ocean. My luck always seems to surface during the final moments of a flea market. Maybe it's a "save the best for last" kind of karma that kicks in or a personal purchase desperation that makes me reach for my wallet, but it's uncanny how many times I make my best purchase of the day in the final minutes. This trip was no different. While navigating the last row of the market, we found ourselves in front of a table with piles of cheap toys. Nothing was in prime condition, but nothing was total garbage either. Simon and I frantically rummaged through the heap like two excited chickens searching for feed. Jess casually sifted through the plastic pile like a sane person and then moved along for greener pastures. Us two guys remained glued to the table, determined to find something...although it might've just been the intense heat that kept our feet planted in the asphalt. After my hands had been firmly coated in old-toy grime, I had made 2 discoveries. 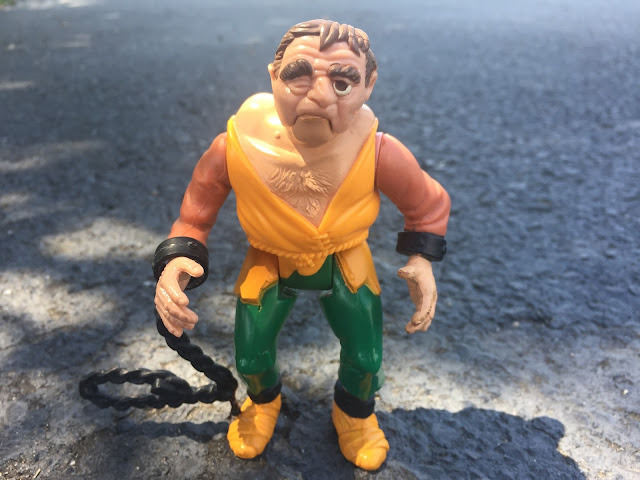 The first was Quasimodo from the old Real Ghostbusters toy line. 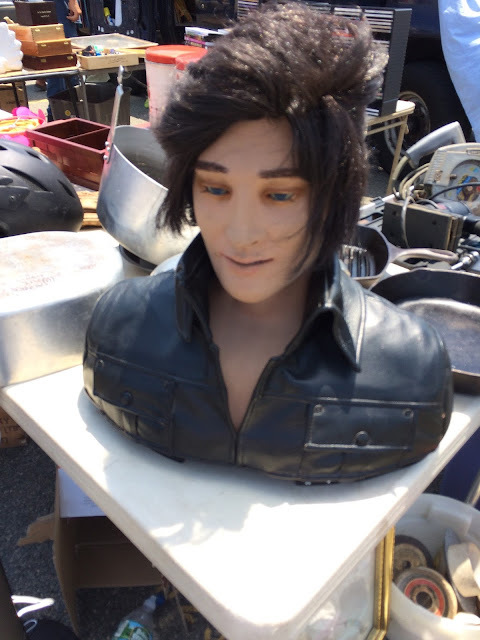 The hunchbacked figure was in solid shape despite being banished to a table of flea market relics. I love this Monsters wave in the Ghostbusters toy line but am collecting them very slowly and only for very cheap. This dude fit that bill, and now joins a few others I've also found at flea markets over the years (Dracula, Frankenstein, and Wolfman). At this rate, I'll probably complete the set in 2027. 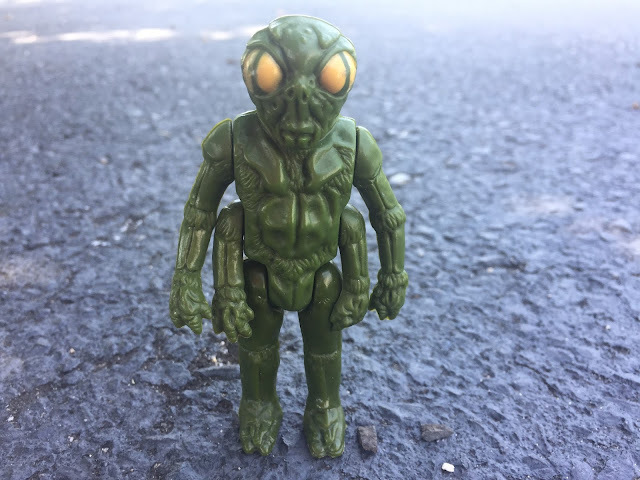 My second discovery was a little 4-armed alien with bulging eyes and a face only a mother could love. I had no idea what this figure was from, but he looked like my type of freak (I later learned his name is Ovion, a cheesy costumed character from the original Battlestar Galatica series). The seller sold me both dudes for $3, a price that's very easy to swallow - it's equivalent to 3 adult diapers! Riding a high, we made an impulsive purchase as we headed for the exit. 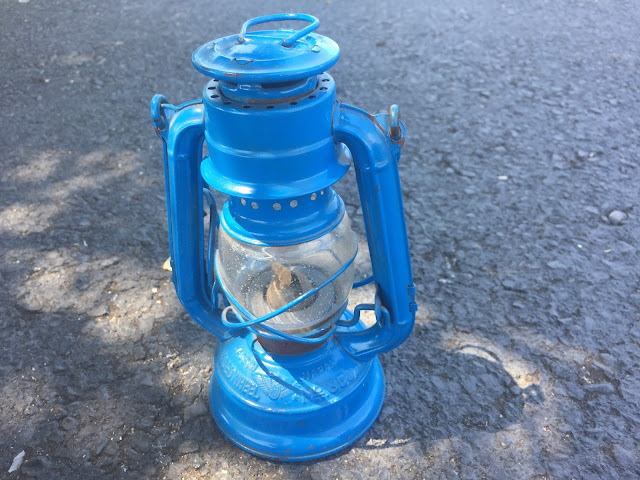 Jess and I scooped up a tiny blue lantern, originally made in Japan. For $3, the accent piece goes with other similar pieces we have on display in our home. Toys and a tiny lantern - trophies from my first North Jersey flea market experience. The place was wild, weird, and lovable - a combination that shouldn't have worked, but did. We capped off the victory with a trip to the Garden State's best, award-winning diner, The Pompton Queen. The feast was fit for kings, as we chowed down gyros, chicken & waffles, and the place's signature item, chicken chicken taverna (which takes 30 minutes to prep). We were too busy gulping down iced coffees and enjoying the fine dining that I forgot to snap photos of our meals. This very New Jersey-looking sign will have to suffice. Not quite the same, but I swear our tastebuds were pleased and bellies full. The sun wasn't setting anytime soon. After a couple hours in the scorching heat, we couldn't bear to return. Still in the mood for browsing toys and being surrounded by strange people, we journeyed into a nearby Walmart. The place wasn't dirty, it wasn't clean, it was just what you would expect - it was Walmart. But, it had air conditioning! Simon and I made our way to the back of the store, where shamed adults don't have to be seen looking at toys. 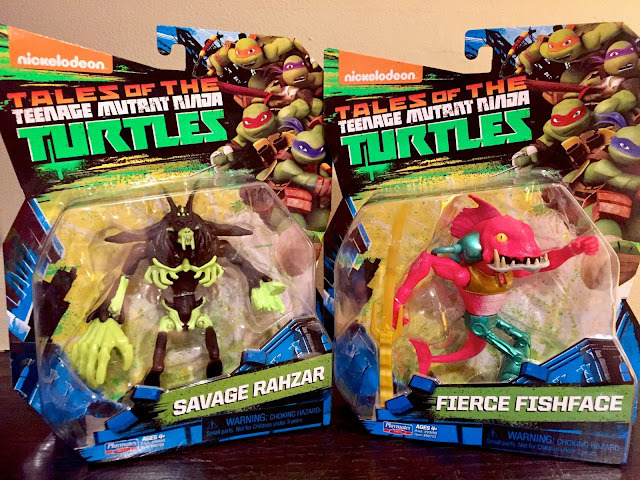 We skimmed the selection taking everything in and I was surprised to find a new TMNT figures. Hanging from the shelf were Rahzar and Fishface, repaints of figures that came out years ago. These toys molds are exactly the same as their originals, but boast wildly different colors. I feel like a sucker buying the same toys again, but the new color schemes were too cool to pass up. The hues remind me of Halloween and monster movies. If that was the intention, the gimmick worked easily on me. I purchased both figures without giving it a second thought. From the flea market to a diner, with a bit of Walmart mixed in, the journey ate up most of the day. Simon had to get back on the road for his drive home. We said our goodbyes, praised the flea market gods, and then he was gone. But I still had a hankering for more junk! Check out Part of my Flea Market Fallout - coming soon! Just an FYI - Playmates has released a ton of new (old) repainted figures this year. What you grabbed was just the tip of the iceberg. They're all so good. I do think Fishface is my favorite though. Those legs! came across your blog and glad to see a fellow TMNT fan. Even I could not have resisted the toy pile you guys found at the end.